What is Alcohol Withdrawal? Are There Withdrawals from Alcohol Use? Alcohol withdrawal refers to a set of clinical features that emerge once alcohol use is stopped (or reduced significantly) following a pattern of drinking that has been excessive and prolonged. As a result of regular exposure to alcohol over a prolonged period of time, a new physiological baseline develops, causing a readjustment of bodily systems to a new state of equilibrium whereby both the body and mind learn to function in its presence. Consequently, when the exposure to alcohol is stopped abruptly (or reduced significantly) the body and the mind react to its absence in the form of withdrawal symptoms. This involves alterations in the levels of various neurochemicals and changes in the activity of various regions of the brain. The withdrawal symptoms tend to be quite the opposite of the effects of intoxication and usually start 6-48 hours after someone has their last drink. Alcohol withdrawal symptoms can range from the mild to severe, and can progress to life-threatening in some instances. The chances of experiencing acute withdrawal symptoms—as well as the intensity of the actual withdrawal syndrome itself—will vary from individual to individual and will be highly contingent on the severity and length of physical alcohol dependency, as well as the duration that has passed since the last drink was consumed. Alcohol withdrawal is more likely to occur among adults with a long history of daily drinking, although it can also occur in teenagers and children who abuse alcohol. If you are concerned about your own or a loved one’s alcohol use, call 1-888-993-3112Who Answers? to speak with a treatment support specialist about the alcohol withdrawal treatment options. Alcohol is a central nervous system depressant. After a certain length of time, the individual struggling with alcohol abuse can experiences adaptive neural changes as part of the development of a physiological alcohol dependency. When such an individual abruptly stops drinking, withdrawal symptoms may appear that reflect a general state of counter-reactive central nervous system overactivity – to dangerous extents, in some cases. Autonomic hyperactivity (in the form of sweating or increased pulse rate). Sleep disturbances in form of insomnia. Additionally, there can be transient perceptual disturbances in form of visual, tactile, or auditory hallucinations or illusions. At times one develops what is known as ‘complicated withdrawal’. It is characterized by emergence of grand mal seizures and delirium (as part of a condition known as delirium tremens – or, more colloquially, as the DTs). In those at risk for delirium tremens, symptoms will usually develop 6 to 8 hours after the cessation of alcohol use. The psychotic and perceptual symptoms begin around 8 to 12 hours after the last drink. Seizures usually develop within 12 to 24 hours and delirium, if present, around the 72-hour point. Although the risk of developing delirium continues to be high during the first week of withdrawal, at times mild, protracted withdrawals can exist for periods up to 3- 6 months. These protracted withdrawals, although mild in nature, are disturbing and can contribute to relapse to alcohol use. 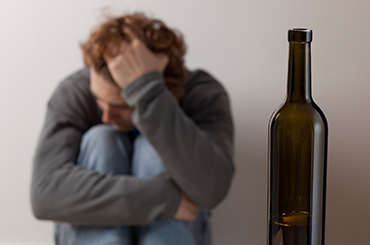 The severity of alcohol withdrawal tends to vary across individuals. Even individuals with a similar pattern of alcohol abuse can experience withdrawal effects with markedly differing levels of intensity. Consumption in larger amounts over a longer time period is likely to lead to comparatively more intense withdrawal. Concurrent use of another psychoactive substance such as a benzodiazepine drug can also add to increased intensity of withdrawals. In such individuals, the onset of withdrawal can be delayed, especially if the benzodiazepine being used is long-acting. The doctor will need to be vigilant to the potential delay, and it underscores the importance of a detailed drug history as part of the initial clinical evaluation. Poor general health conditions and presence of co-occurring physical and psychiatric disorders tend to worsen intensity of withdrawal. Various psychological factors such as the ability to tolerate discomfort and personality traits also shape the subjective experience of alcohol withdrawal. Repeated withdrawal episodes also tend to increase the severity of withdrawal symptoms in some alcoholics. Additionally, being older than 30 years, having a history of sustained drinking and previous delirium tremens is associated with an increased likelihood of developing delirium tremens. Alcohol addiction is a chronic disorder of the brain. Because of the chronicity, the most effective treatment options allow for ongoing and potentially long-term management to sustain recovery. Alcohol withdrawal is potentially life-threatening and hence is best managed under medical supervision. Benzodiazepines continue to be the first line of medications to manage alcohol withdrawal. Benzodiazepines, preferably longer acting ones, are used to take care of withdrawal features as these have cross-tolerance with alcohol. Different loading doses and subsequent dosing schedules can be used based on the initial presentation and, later, the progression of withdrawal symptoms. Following stabilization of the dose, it is gradually tapered off over a period of next 7-10 days. Fluid and electrolyte balance also needs to be maintained. Additionally, thiamine should be administered in order to prevent or treat a potential complicating phenomenon known as Wernicke’s encephalopathy. While oral dosing usually suffices for mild to moderate withdrawal, those with severe or complicated withdrawal may require parenteral (typically, intravenous) dosing. It has been reported that those with mild withdrawal symptoms may benefit from supportive care alone in the form of a quiet environment, reduced lighting, limited interpersonal interaction, nutrition and fluids, reassurance, and positive encouragement. However, the supportive care does not prevent hallucinations or seizures. Complicated alcohol withdrawal is a medical emergency and needs to be managed using appropriate, relevant protocols. Treatment of alcohol withdrawal is an essential initial step in the overall management of addiction to alcohol. It should be integrated seamlessly into the long-term phase of management. But treatment needs vary based on someone’s specific situation; call 1-888-993-3112Who Answers? to discuss which treatment is more suitable for you or your loved one to transition back into a sober and drug-free lifestyle. Alcohol withdrawal can be successfully treated as part of a comprehensive treatment plan for alcohol dependence. Management of acute alcohol withdrawal can occur in both outpatient or inpatient treatment settings. Past history of complicated withdrawals. Presence of psychiatric or medical comorbidity. Poor social support system or a disruptive home environment. Also, failed treatment attempts from outpatient setting and personal preference are indications for inpatient treatment settings. Those with mild and moderate withdrawals—especially when well motivated—can be managed in outpatient treatment settings. This not only brings down the overall cost of treatment but also prevents interruptions in familial and work obligations and responsibilities. How to Care for Someone Going Through Alcohol Withdrawal? Being present around a loved one while they going through alcohol withdrawal is never easy, but knowing what to expect can help you better assist them during this difficult process. Someone going through alcohol withdrawal can experience some frightening physical symptoms as well as range of negative emotions, including anxiety, irritability, rapidly cycling emotional changes, foggy thinking and depression. Providing support to a loved one experiencing these exacerbated negative emotions can be particularly challenging. You’ll also need to be aware of your own emotional needs while taking care of your loved ones. You may consider joining a self-help group meant for family members or friends of those battling alcohol addiction. Reminding yourself and the alcohol-dependent person you are helping that the process of withdrawal will ameliorate after 48 hours can help set expectations of improvement when symptoms seem unendurable. However, nothing can replace the importance of getting trained support for your loved one and yourself, call 1-888-993-3112Who Answers? to learn more about resources available for you both. Anton, R et al. Efficacy of a combination of flumazenil and gabapentin in the treatment of alcohol dependence: Relationship to alcohol withdrawal symptoms. Journal of Clinical Psychopharmacology 29(4):334–342, 2009. Bayard, M M.D. et al, Alcohol Withdrawal Syndrome. Am Fam Physician. 2004 Mar 15;69(6):1443-1450. Myrick, H and Anton, R (2015) Treatment of Alcohol Withdrawal. National Institute on Alcohol Abuse and Alcoholism (NIAAA). Principles of Drug Addiction Treatment: A Research-Based Guide (Third Edition) (2012), www.drugabuse.gov. Shaw, J, (8.16.2015) How to Help Someone Detox From Alcohol at Home, Livestrong www.livestrong.com. World Health Organization (2015) Management of Alcohol Withdrawal http://www.who.int/mental_health/mhgap/evidence/alcohol/q2/en/. How Can You Help A Klonopin Addict? Will My Husband Ever Quit Abusing Narcotics? Will He Hit Me Again??? Do I Have Bipolar Disorder? Does Being Drunk Bring Out The True Personality? Does My Husband Have Bipolar Although The Doctors Said He Doesn't? How Do I Help My Grieving, Substance Abusing Daughter? Can't Kick Him Out While He's Down. My Boyfriend, Does He Need Help? It Seems Like I Have To Choose Between My Husband And My Son! Has The Medical Profession Asked WHY ? Can Withdrawal From Alcohol Kill You? How To Help My Jailed Alcoholic Son? Why Isn't Drug Addiction Considered A Mental Illness? How Can I Help My Alcoholic Unmedicated Bipolar Girlfriend? How Much Is Too Much Alcohol?